Aston Martin has debuted the Rapide S as the most powerful four-door Aston Martin to date and with emphasis on a new, sportier look. Britain's iconic carmaker has released a new, sleeker, more powerful version of the Rapide, boasting 17% greater peak output and a sportier character. The Rapide S is a four-door, luxury GT that has been redesigned from its original Rapide benefactor will replace the original in global markets. As you can see from the gallery attached, the new Aston has a more imposing front fascia thanks to a newly-designed grille that is slightly wider and more toothy than its predecessor. The headlamps are similar to the outgoing Rapide as is the bonnet curve, but they've been stretched slightly for a more sporty appeal while the fenders retain the same flair seen earlier. At the rear, a more pronounced aero flip on the boot hints at higher speeds and actually functions to counteract lift during high speed driving. Other body changes are light, but given a noticeable overall effect of power and speed. Exterior options include a Carbon Exterior Pack for adding carbon fiber details to the front splitter, rear diffuser, mirror caps, and rear lamp infills. Uniquely, the new Aston Martin Rapide S uses a design under the grille and new bonnet to comply with Europe's new pedestrian impact protection requirements. Rather than add plastic nose cone bumpers and grille work, Aston created a new, patent-pending design for "keystone construction" to enable the grille to move rearwards on impact and inserted outboard chin stiffeners to give rigidity to the lower structure and meet leg impact regulations. Cut-outs on the front wing catwalks contribute to headform regulation as well, allowing Aston Martin to retain its design ethos and premium materials use while still making safety targets. Interior refinements focus on improved technology refinements and more sports-oriented options. Hand-crafted, pure glass transmission selector switches and other bespoke options set off the higher refinements of the 558 PS. Sporting options include duotone perforated red and black leather seating and more control over the engine sounds heard in the cabin. The biggest changes are under the hood. A new AM11 naturally-aspirated 6.0-liter V12 powerplant, which increases peak power output by 17% over its predecessor, giving 558 PS at 6,750 rpm. Peak torque hits 620 Nm at 5,000 rpm with low-range torque increasing by 40 Nm over the previous version at idle to 4,000 rpm with an additional 50 Nm adding in at 2,500 rpm. This shaves 0.3 seconds from the Rapide's 0-62 mph time, putting it at 4.9 seconds with a higher top speed of 190 mph. Race car technology on the new V12 include fully CNC machined combustion chambers and lighter, hollow cam shafts all taken from Aston Martin's WEC GT winning race campaign. Dual variable camshaft timing, knock sensing, and a fully catalyzed stainless steel exhaust system cap all this off. Despite the power increase, the engine drops CO2 emissions by 7% (to 332 g/km) and fuel economy rises to 19.9 mpg on the EU combined cycle. In addition, the engine has been lowered by a massive 19mm versus the outgoing car's engine placement, making the center of gravity and performance handling of the new Rapide S much more dynamic and inherently stable. A new set of dynamic stability control (DSC) system architecture was devised to handle the increased power and change in stance the new engine and its placement created. This couples with the latest AM Adaptive Damping System (ADS) with three driver-selectable settings for driving character. The ADS also automatically alters suspension if the driver does not manually set it, maximizing control for the given situation. The transmission from the previous-generation Aston Martin Rapide is retained, though it's been recalibrated to match the higher torque and output of the new engine. 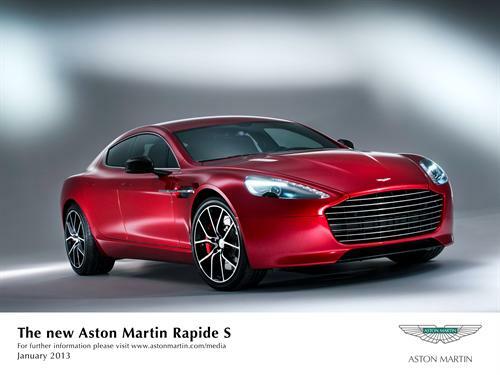 The new Aston Martin Rapide S is definitely a great new rendition of this classically modern British auto.